The Gloster Gauntlet was a single-seat biplane fighter and was the last RAF fighter to have an open cockpit. The prototype first flew in 1933 and the Mk. I entered service in May 1935. This was replaced in production by the Mk. II after 24 had been completed. 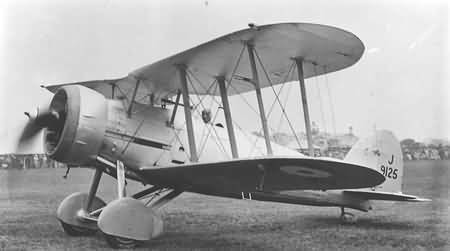 The new model used different construction methods following the merger of Gloster with Hawker-Siddeley and entered service in May 1936. 204 Mk. IIs were produced. The Mk. I was withdrawn from front-line service in 1938, while the Mk. II survived until the outbreak of World War II. 3 Sqn RAAF sailed from Sydney on 15 July 1940 arriving in Egypt on 23 August 1940. The squadron was placed under the command of the Royal Air Force's Middle East Command and organised a three flight army co-operation squadron: two flights were equipped with Gloster Gauntlet and Gladiator fighters and the third with Westland Lysander utility aircraft. It commenced active operations in support of British Commonwealth land operations in the Western Desert on 3 November 1940. The Gauntlet's were replaced in January 1941.